Using scrap yarn, size 7 needles, and a provisional cast-on,** cast on 72 (80, 88, 96) sts. Change to main yarn and knit one row. Join work into round, being careful not to twist. Place marker at beginning of round. Knit every round until piece measures 3.5″ (3.5″, 4″, 4″). 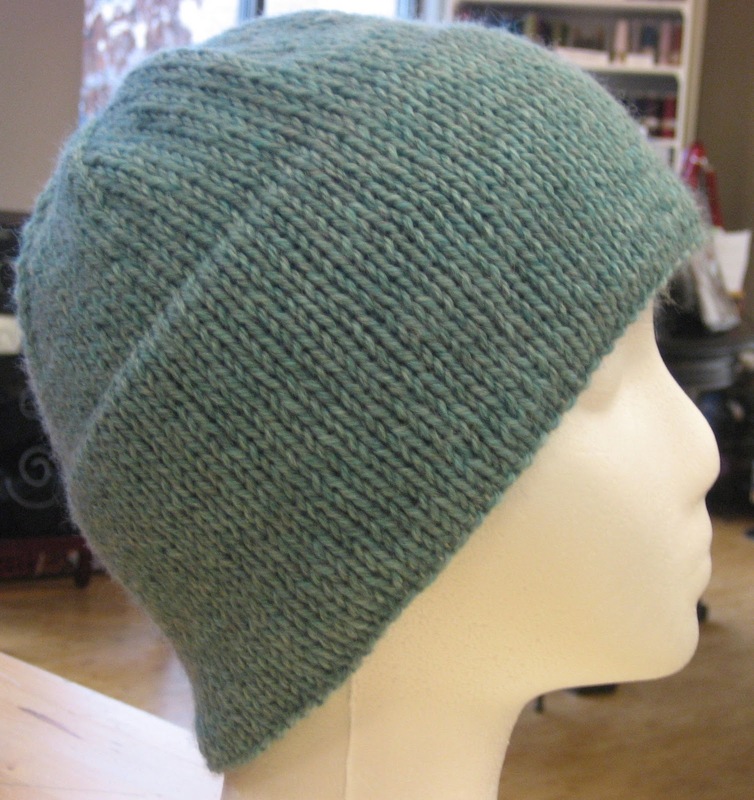 Knit every round until hat after purl row is the same length as hem before purl row. Unzip your provisional cast-on, and transfer live stitches onto the size 7 needles. Fold the material at the purl row, so that the wrong side is on the inside of the hem, and the two needles are held with the size 7 on the inside of the hat and the size 8 on the outside. 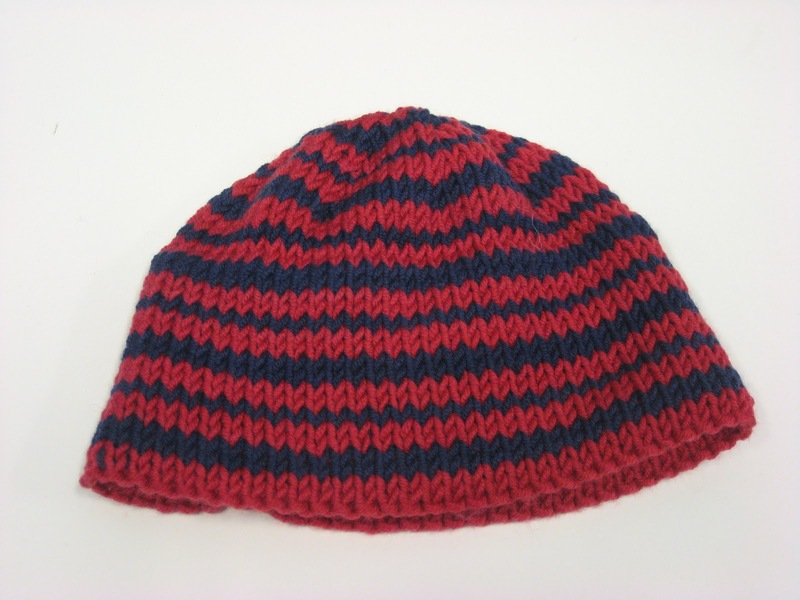 Knit one stitch from the size 8 (front needle) together with one stitch from the size 7 (back needle) – repeat around hat. 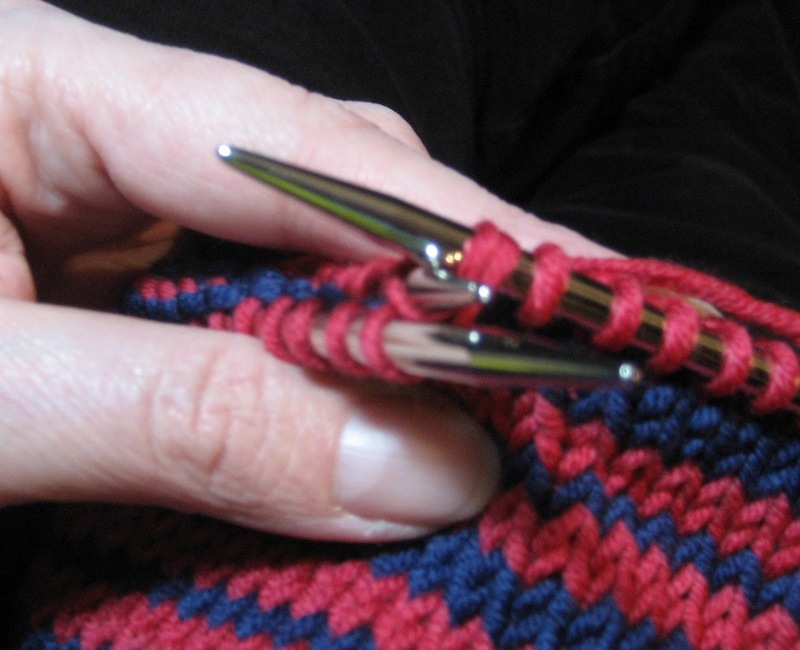 This is similar to the way you would do a 3-needle bind off. When round is complete, continue knitting the rest of the hat with the size 8 needle. 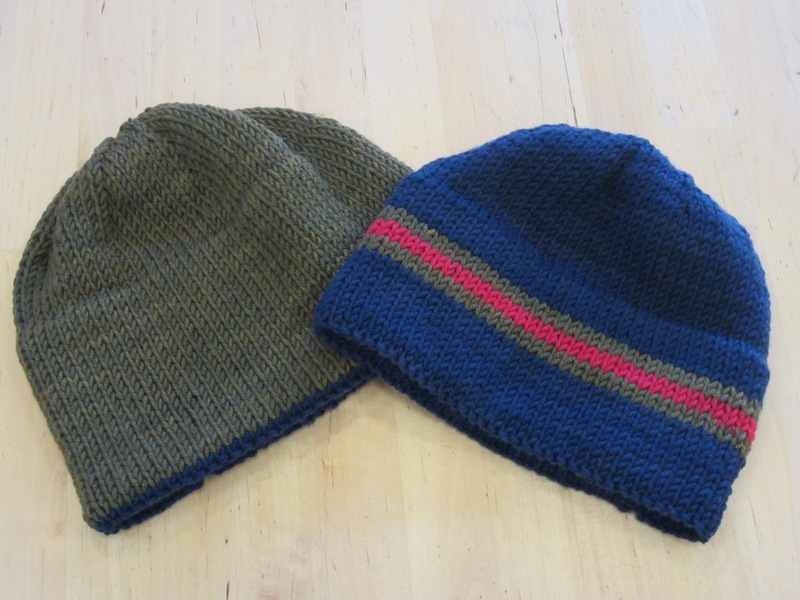 Knit each round for 1″ (or longer if desired). Row 1 – *K7 (8, 9, 10), K2tog,* repeat from * to * to end. Repeat these two rows, decreasing one K st before K2tog on every Row 1 (for instance, the next decrease row will be K6 (7, 8, 9) sts before the K2tog), until 16 sts remain. Next Row – K2tog around. Break yarn leaving a 6″ tail. Thread tail through the remaining live stitches with your tapestry needle and pull tightly. Thread through the same sts once more to secure and weave in the end on the inside of your hat. Here are some of the hats I’ve completed using this technique. In the red, green and navy hats, I used Artyarns Ultramerino 8. In the light blue hat, I used Cascade 220. 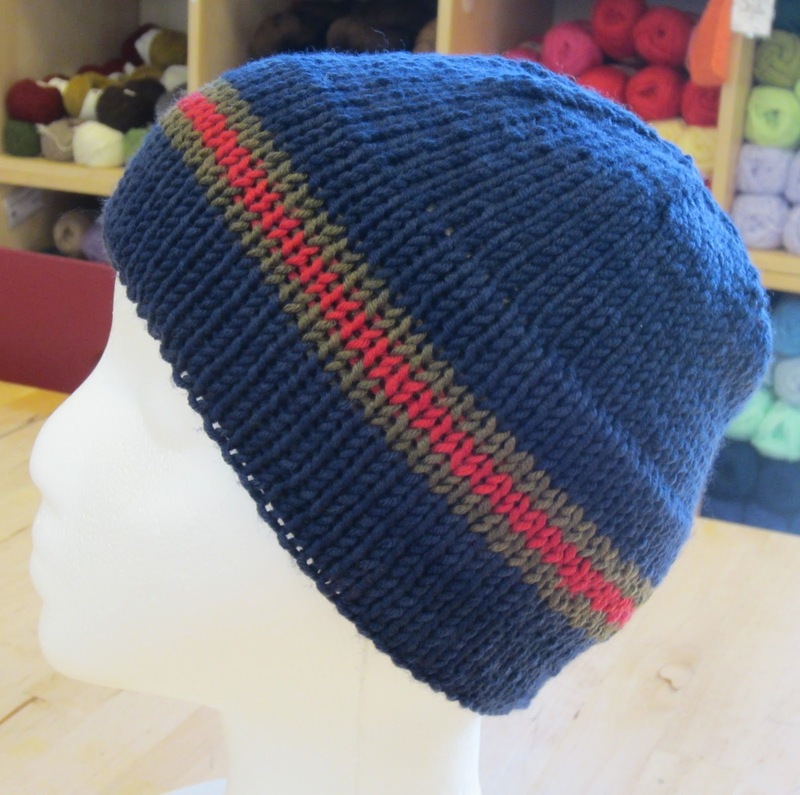 This pattern is easy to adapt – try adding stripes or do your hem a different color than the main body of the hat. Finish off the top with a pompom or an i-cord for a fun effect. ** There are several ways to do a Provisional Cast-On. The one I like the best and used for this project is the Crocheted Provisional Cast-On. Click here for a good video tutorial on how to do this technique. If you prefer a knitted Provisional Cast-On, try this video tutorial.